Efforts to control brucellosis in the Greater Yellowstone Area (GYA) should focus on reducing the risk of transmission from elk, which are now viewed as the primary source of the infection in new cases occurring in cattle and domestic bison, says a new report by the National Academies of Sciences, Engineering, and Medicine. Federal, state, and tribal groups should work in a coordinated and transparent manner to address brucellosis in multiple areas and jurisdictions. Brucellosis is found in cattle, bison, and elk and can result in late-gestation abortion, decreased milk production, and loss of fertility. Other animals can be infected by coming into contact with infectious materials (such as aborted fetuses or afterbirth), and Brucella abortus – the bacterial pathogen that causes brucellosis – can spread to calves through nursing. Brucella abortus is not considered a major public health threat in the U.S., but there are potential economic consequences. States must maintain brucellosis-free status, among other criteria, to sell live cattle. Since the Academies' first report on brucellosis in the GYA issued in 1998, the disease has re-emerged in cattle and domestic bison herds in the region. Between 1998 and 2016, 22 cattle herds and five privately owned bison herds were affected in Idaho, Montana, and Wyoming; all other states in the U.S. are free of the disease. 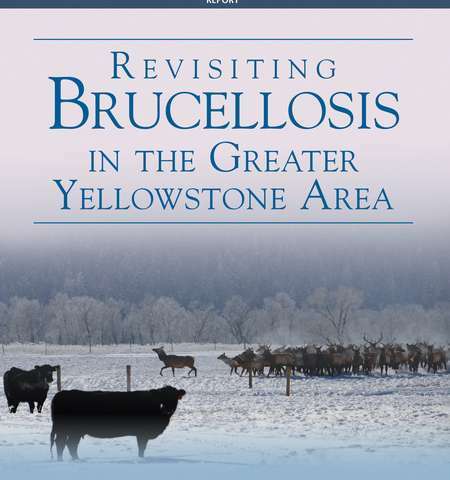 "One of the most significant changes in our understanding of brucellosis since 1998 is that the disease in the Yellowstone area can be traced genetically and epidemiologically to transmission from elk, not bison," said Terry McElwain, Regents Professor in the Paul G. Allen School for Global Animal Health at Washington State University and chair of the committee that conducted the study and wrote the report. "Federal and state agencies should focus on controlling transmission from elk, including undertaking modeling efforts that can characterize and quantify the risk of brucellosis transmitting and spreading from and among elk." While eradicating brucellosis in wildlife from the GYA remains a distant goal, the committee said the focus should be on making significant progress toward reducing or eliminating brucellosis transmission from wildlife to domestic species. In order to achieve this, federal and state agencies should consider several different management options that can reduce the risk of brucellosis transmission. Such tools include reducing the elk population by hunting, contraception trials in elk, and conducting tests on elk for brucellosis infection and subsequently removing them.